This email is sent only to subscribers.� To subscribe or unsubscribe, email info@PathologyOutlines.com, indicating subscribe or unsubscribe to Case of the Week.� We do not sell, share or use your email address for any other purpose.� We also have emails for Pathologist/PhD jobs (biweekly), Other laboratory jobs (biweekly), website news (monthly), new books (monthly), and a newsletter (twice a year).� You must subscribe or unsubscribe separately to these email lists. We have added a Consumer Goods section to our Buyer�s Guide.� This page now contains many companies with products and services of interest to pathologists and laboratory personnel in both their professional and personal lives.� Visit our Buyer�s Guide as your first step when thinking about products to purchase. 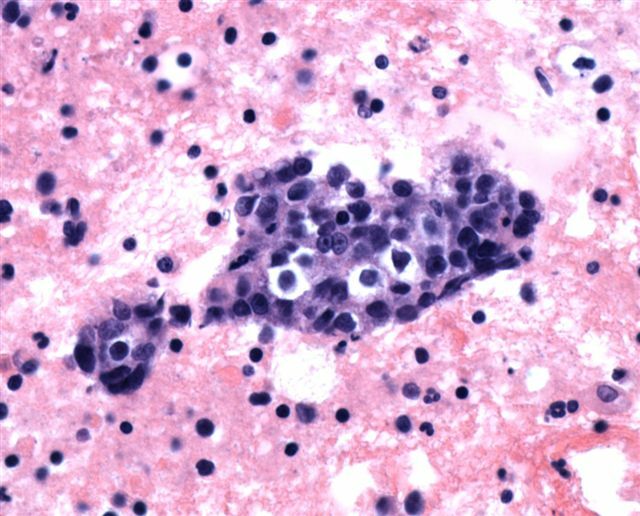 We thank Dr. Lisa A. Cerilli, University of New Mexico Health Sciences, Albuquerque, New Mexico (USA), for contributing this case.� To contribute a Case of the Week, please email info@PathologyOutlines.com with the clinical history, your diagnosis and microscopic images in JPG, GIF or TIFF format (send as attachments in any size, we will shrink if necessary).� Please include any other images (gross, immunostains, etc.) that may be helpful or interesting.� We will write the discussion (unless you want to), list you as the contributor, and send you a check for $35 (US dollars) for your time after we send out the case.� Please only send cases with a definitive diagnosis, and preferably cases that are out of the ordinary. 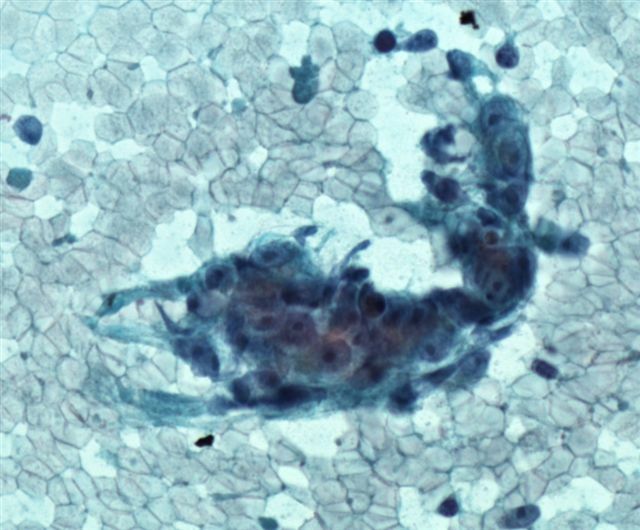 A 50 year old man had bilateral enlarging neck masses for 10 months.� A core needle biopsy and cytology specimens were obtained. 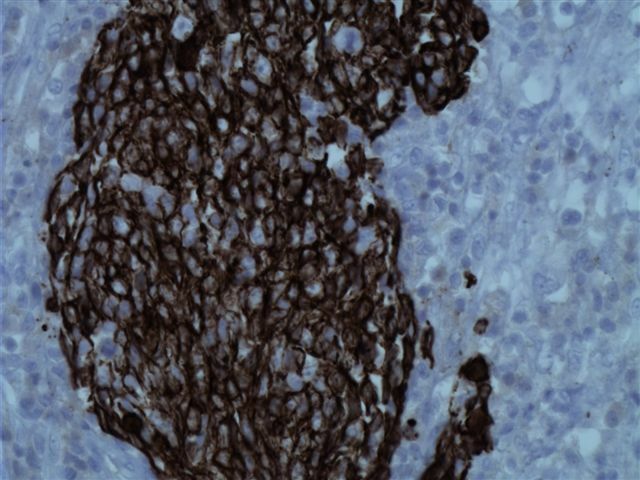 EBER stains were strongly immunoreactive (EBER #1;� EBER #2). Nasopharyngeal carcinoma is rare in the US (incidence of 0.4 per 100K in whites), but it is endemic in South China (21.4 per 100K in Hong Kong, see table) and parts of Africa.� It is strongly associated with Epstein Barr virus infection.� Other risk factors include consumption of salt-preserved fish containing carcinogenic nitrosamines, family history, specific HLA class I genotypes, tobacco smoking, chronic respiratory tract conditions and low consumption of fresh fruits and vegetables (Cancer Epidemiol Biomarkers Prev 2006;15:1765).� The patient in this case was a native of New Mexico - other risk factors are unknown. 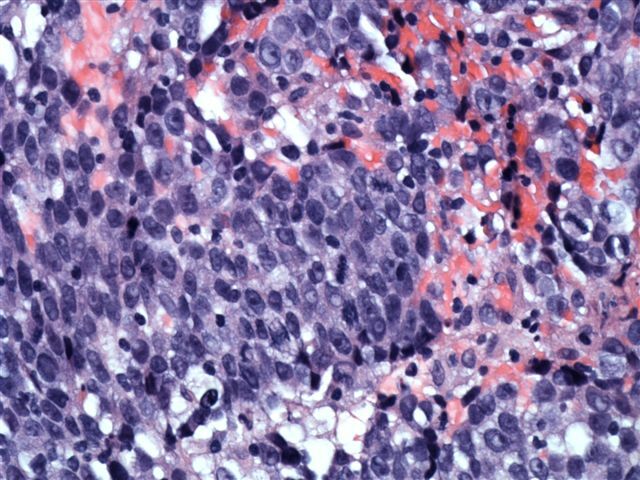 Nasopharyngeal carcinoma is classified into three histologic subtypes - keratinizing squamous cell carcinoma (WHO type 1), nonkeratinizing-differentiated (WHO type 2) and nonkeratinizing-undifferentiated (WHO type 3). 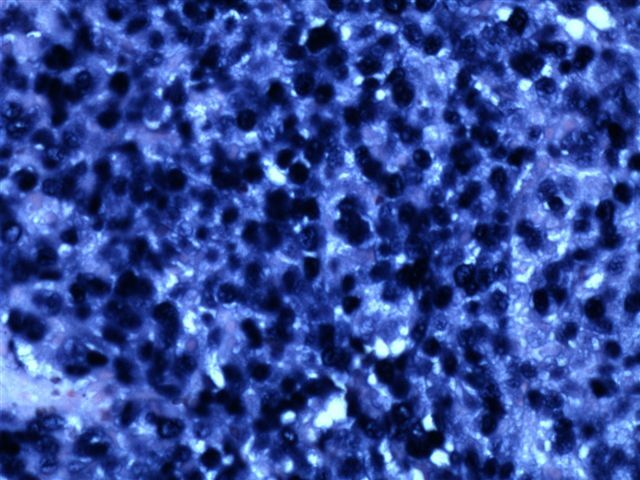 The differential diagnosis includes sinonasal undifferentiated carcinoma (SNUC) and melanoma.� �SNUC arises only in the nasal cavity and paranasal sinuses.� Tumor cells are hyperchromatic with coarse chromatin, and individual cell necrosis and central necrosis of cell nests are common.� Tumor cells are EBER-1 negative (AJSP 2002;26:371).� Melanoma usually has different clinical characteristics and immunostaining properties, although the histology may be similar. 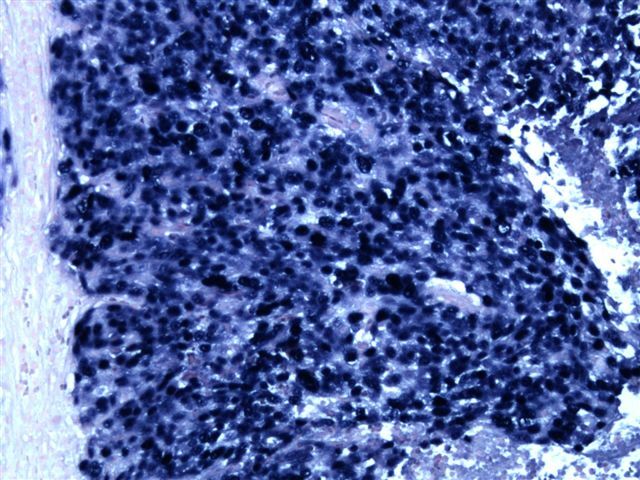 Treatment of undifferentiated nasopharyngeal carcinoma consists of immunotherapy with interferon, chemotherapy and radiation therapy.� The 5 year survival is 50-60%.